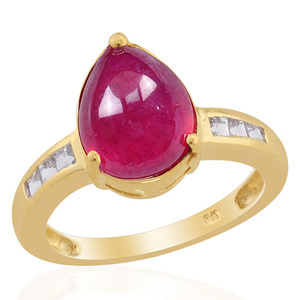 Ruby rings such as The Jewellery Channel’s 9K Y Gold African Ruby, White Topaz Ring Size O 4.425 Ct. (£199.95) is a beautiful fusion of gold, topaz and African ruby. Set in a teardrop shape, the ruby sits on a band of yellow gold and is surrounded either side by 3 topaz gemstones. With a total of 7 gemstones, this ring will make an impressive gift. 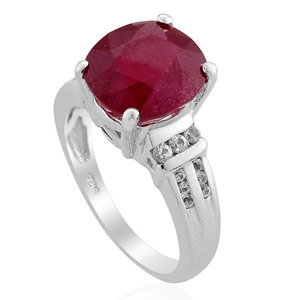 If you prefer the combination of silver and ruby, The Jewellery Channel’s Platinum Overlay Sterling Silver African Ruby, Sri Lankan White Sapphire Ring Size O 7.750 Ct. (£159.95) is the ideal choice. Featuring an African Ruby surrounded by 6 Sri Lankan White Round 1.8 sapphires and 12 Sri Lankan White Round 1.3 sapphires all set in platinum overlay sterling silver, this ring looks amazing on and will be the focal point of any outfit. Ruby rings from The Jewellery Channel are exciting products from the jewellery conglomerate that manufacturers and handcrafts many of the items sold on its Internet sites and TV networks. By making ruby rings affordable luxury jewellery The Jewellery channel succeeds in offering fabulous jewellery at great prices. Based in the UK with a sister channel in the USA The Jewellery Channel is well established founded in 2006 to help customers get more from their online shopping experience. Rings.org.uk is pleased to showcase ruby rings from The Jewellery Channel and offer visitors the chance to compare different ruby rings and make secure online purchases in time for giving someone special a ruby ring as a lovely surprise this Christmas. Artisan Crafted Sterling Silver Brazilian Green Amethyst Ring Size N 4.75 Ct.
9K W Gold Russian Diopside Ring Size O 1.335 Ct.
9K Y Gold Madagascar Blue Sapphire and Diamond Ring 1.76 Ct.
Diamond (1.00 Ct) 9K Y Gold Ring (Size O) 1.000 Ct.